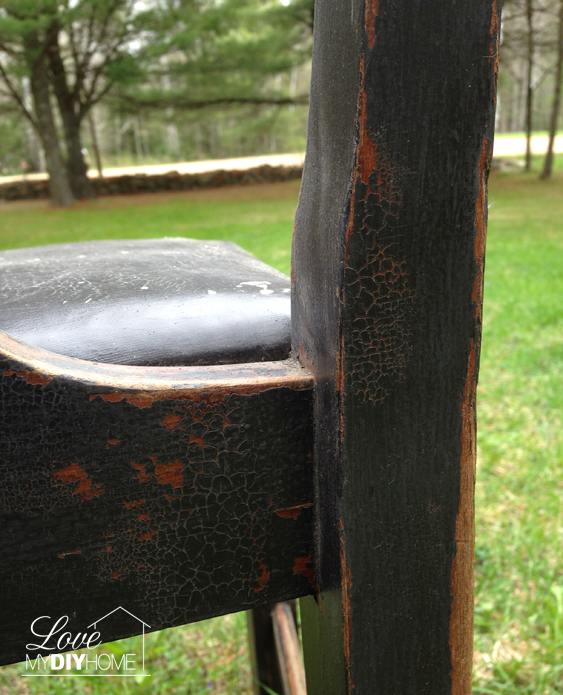 The front porch needed some serious help after our long winter, so the first step was to fix my antique chair, one of my first projects from last year. See it tucked in the corner behind all the big pots next to my grandson’s worm collection? We got this and two other chairs as part of an auction bundle, spray painted it and have had it on my front porch for a year. I wondered if it would survive the winter – yep, I was too lazy to take it in and just kept brushing the snow off as I passed by. The seat only had a few scratches on it, so that is easy enough to fix. 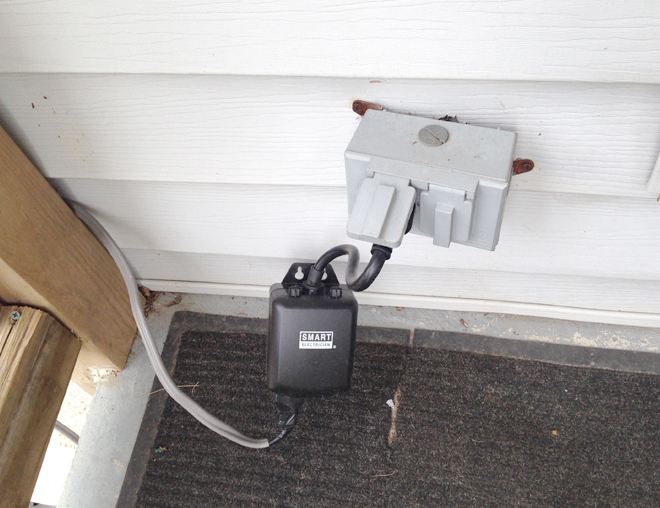 It’s hiding a couple of ugly electrical boxes. 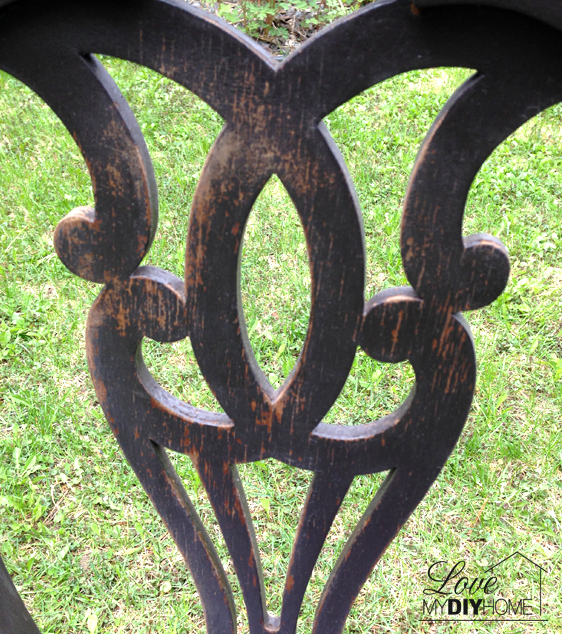 I thought to just go ahead and paint the chair again before putting together a pretty little summer porch deco, but after sanding it down in preparation of a new paint job, I discovered I liked how it looked – kind of a shabby chic look. So I decided to just re-paint the seat. I taped off everything and just left the seat exposed. The results are amazing. The contrast creates visual interest and adds to the overall look. This chair didn’t come with a huge HL price tag. You walk into Hobby Lobby and see all the high priced furniture that you can only enjoy looking at, but never consider buying? You toy with the idea of putting a little money aside every week so you can have it – but you also realize every time that thought pops into your head that you have other more pressing bills. Then the thought of using your credit card pops in but then your good sense pops it right back out again. 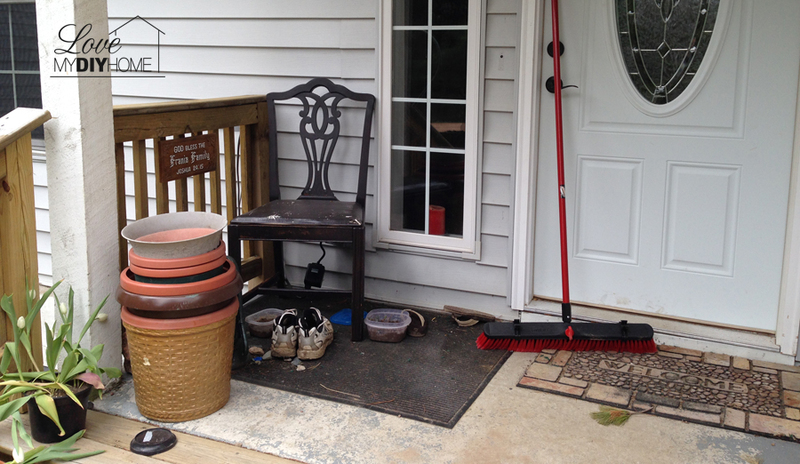 No way would you spend $100 on a chair – no matter how good it would look in your dining room – or in this case, on your front porch. But all that reasoning going on in your head doesn’t mean you can’t have one. That’s why I call it my Better than a Hobby Lobby Hack. 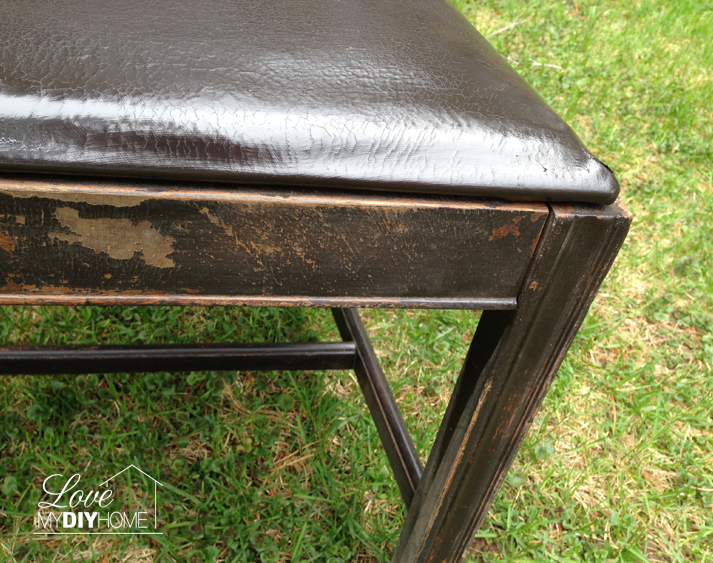 I just grabbed a few tools – really, it doesn’t take much to redo an old piece of furniture. Sometimes we make things so complicated in our thougth process that we quit before we even get started. 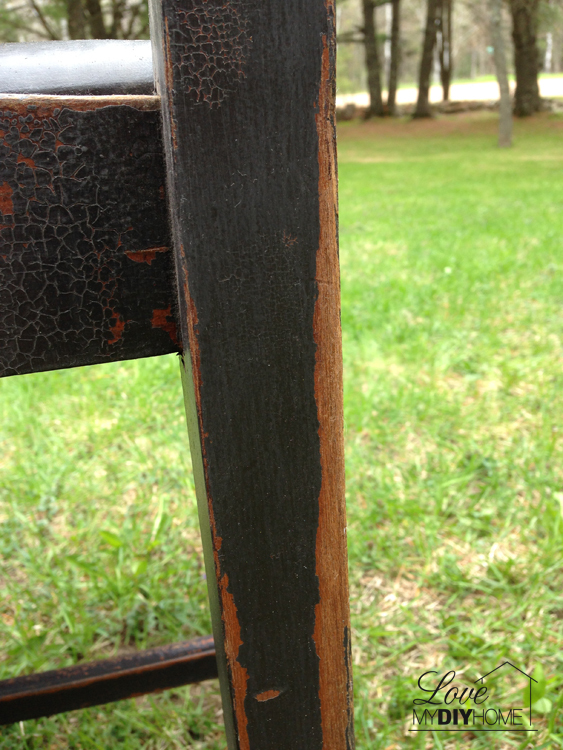 I paid less than $10 for the paint and tools I used to fix this chair. 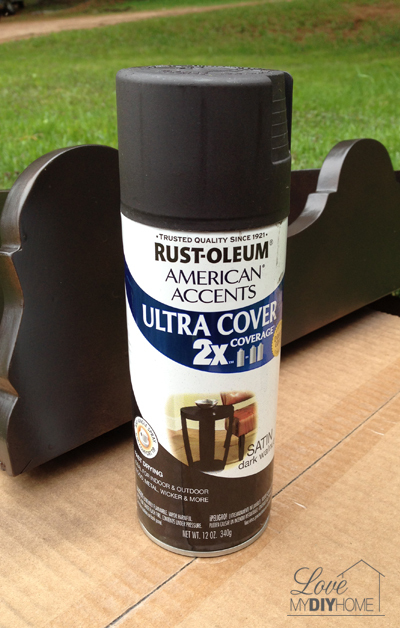 Rust-Oleum 257462 Painters Touch 2X Spray, 12-Ounce, Satin Dark Walnut – $7.31 from Amazon, but a couple of dollars cheaper at Walmart. Isn’t that a classy tool? 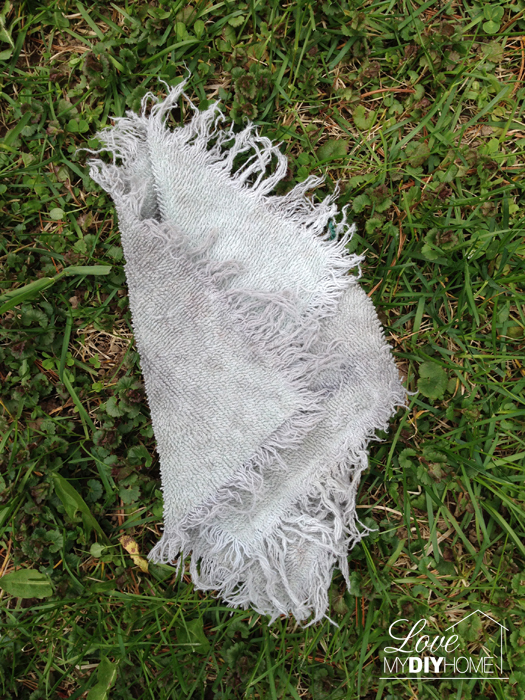 It’s my old towel torn up from a bazillion years ago. 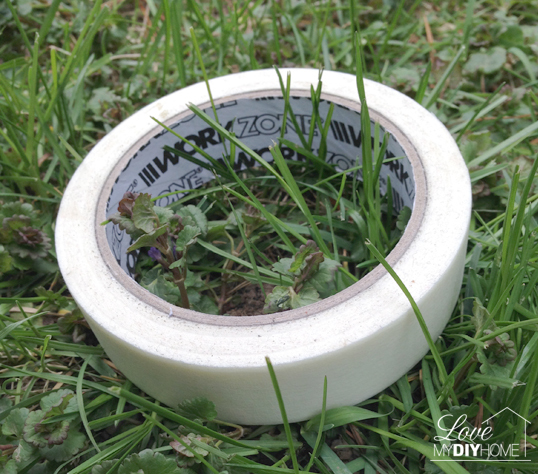 This is cheap-o Masking Tape I had laying around the house – nothing special, maybe costing just $1.00 from Walmart. 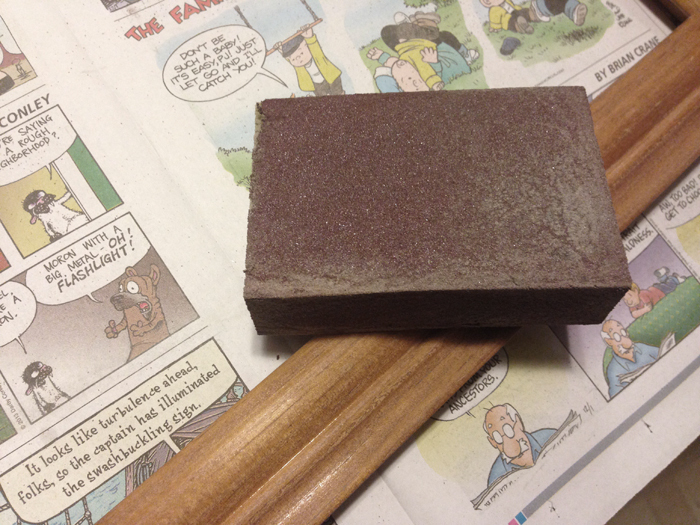 Newspaper and a Sanding Sponge, Fine/Medium, (I used a fine grit, but think I’d have preferred something more gritty) $2.77 on Amazon. It took less than 3 minutes to sand the chair and discover I had a chair like a $100 Hobby Lobby faux antique chair for less than $10. 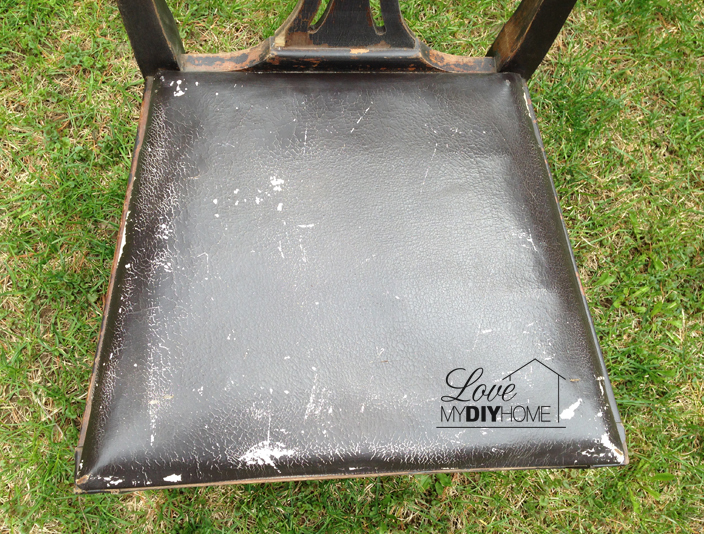 If you consider the fact I already had the sanding sponge, tape, rag, and newspaper and just sprayed the seat, my project cost me just a few cents – for the little bit of paint I used. Plus, it’s a real antique, not a HL faux. 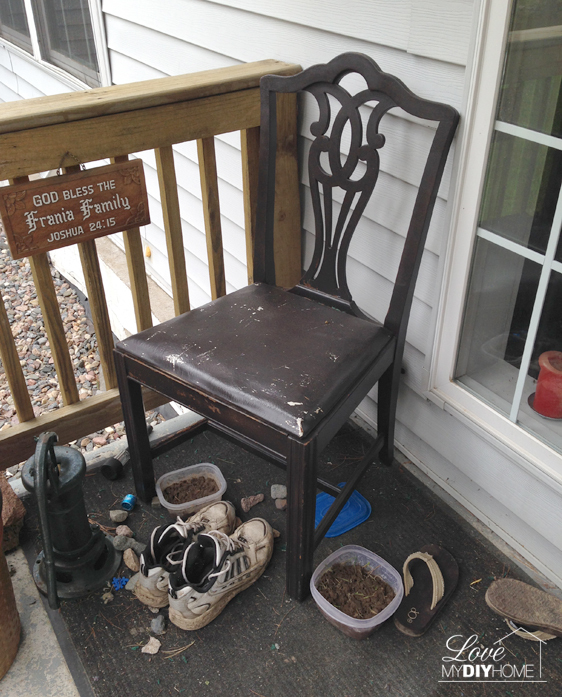 → Hobby Lobby Shabby Chic chairs are too expensive. 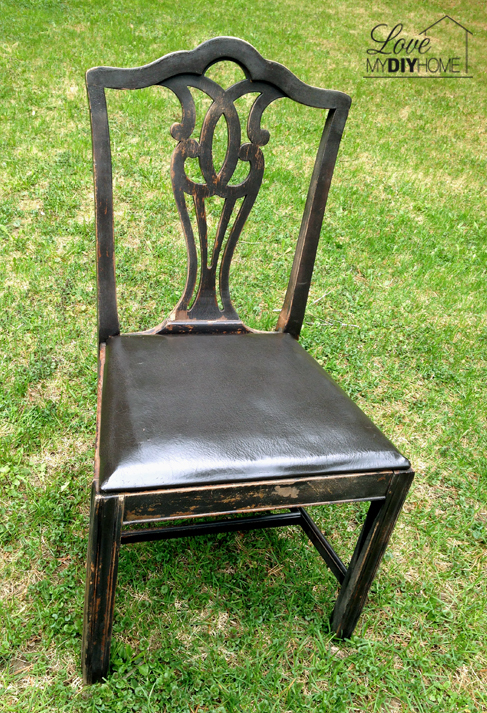 → You can find an antique chair at an auction or garage sale for little to nothing. 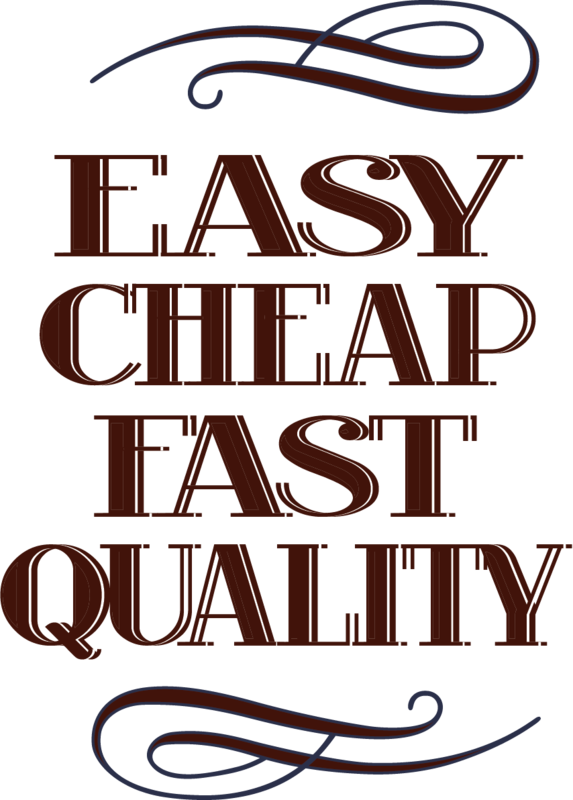 → You can paint it for just a few dollars. → You can leave it out on your covered porch all year and end up with an even better piece after it weathers. → You can sand it and paint it again or leave it weathered looking. → You will have a one of a kind piece of furniture your friends and family will drool over. 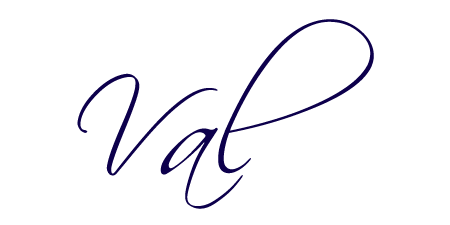 This post contains affiliate links that help support this blog. Thanks for visiting! You have such a talent for taking something ordinary, turning it into something amazing, and explaining how simple it is. I've seen several chair projects lately that have caught my eye – this being one. I really need to plan a thrift trip this weekend to scout out some great chairs. I love how you left the frame unpainted this time. Sometimes I forget that a facelift doesn't have to be radical. A simple single update can be all that's needed. Beautiful chair! Karen, thanks! Sometimes creativity just comes at hte moment you need it and not a minute before. Just grab that paint can and make it up as you go along! Oh my goodness, Val-what a GORGEOUS chair! I'm so glad you didn't paint over that lovely chippiness!! Great transformation-I'm pinning!!! 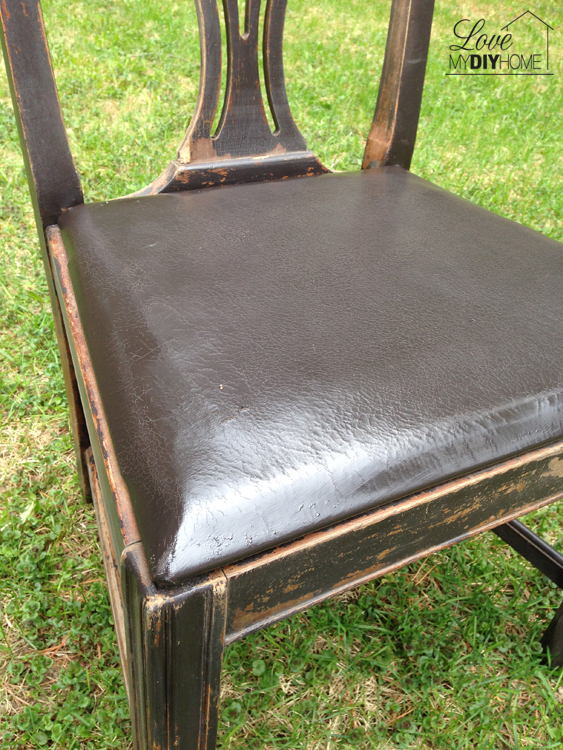 C.d., the chair was so dirty and boring looking, old, and didn’t seem to have much appeal – until I painted it. Oh my, paint makes such a difference! This is gorgeous! 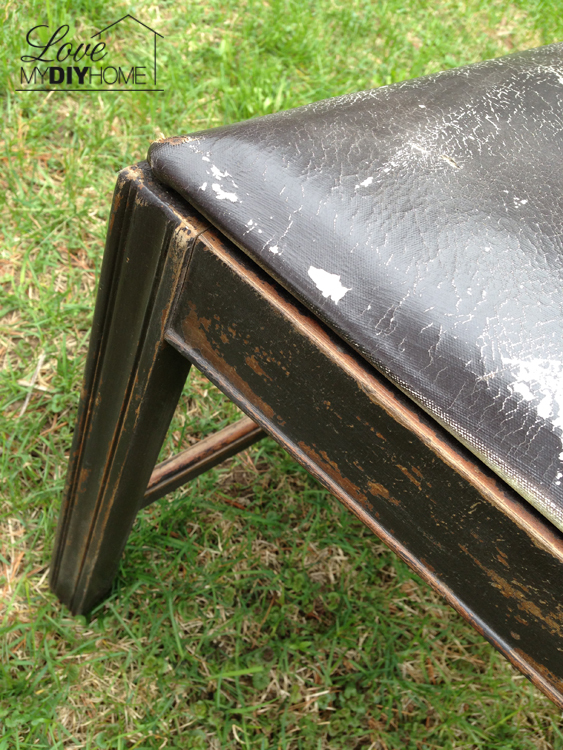 There’s something really satisfying about taking a piece of furniture that needs help and giving it new life. You can really tell the difference between something that’s been loved into existence, and something you just picked up at the store.